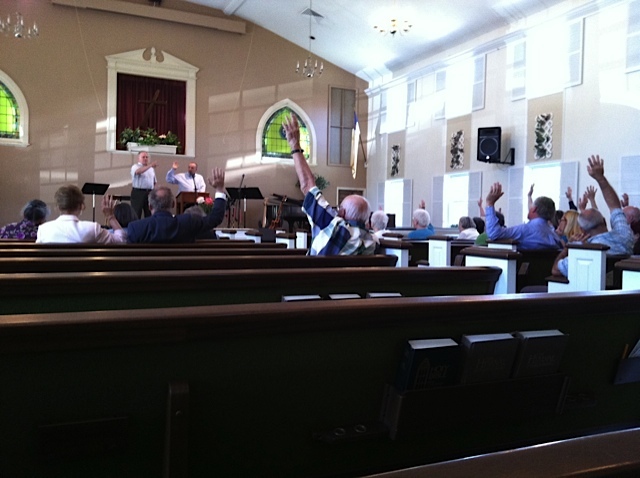 Lessons Learned from a 29 Member 191 Year Old Church. I’m sort of at a loss for words. What I’ve had a front seat for over the last few weeks has been breath taking. Epic. Amazing. Miraculous. I wish you could be with me as I’ve been seeing first hand what God is doing. At 7:30am Wednesday, April 18th we receive a call from a lead elder at a church in Mountainside, NJ asking us if we’d ever consider a church merger. (That’s less than 24 hours after Warren poked this issue with us.) Mike Leahy (who received the call) laughs . . . not because it was funny but because it would seem like God was attempting to get our attention. We met with the leadership team of Mountainside Gospel Chapel a number of times over the next few weeks. I gotta be totally honest . . . I was a pessimist. I thought it was an interesting idea but I didn’t think that a 191 year church would just give their facility right in the middle of where we’ve been looking at our next campus. That sort of stuff doesn’t happen. Does it? Tuesday May 3rd was a turning point in my spirit . . . where I actually started to believe what God was up to. We met with about 11 leaders from the church and explored the possibility of this church rebirthing at Liquid Mountainside. They were talking about dissolving their legal structures and donating all their assets over to us. I wish you could have been in the room. The humility was so thick in the air you could cut it. This group of leaders were catching the vision of what the future could look like. I left that meeting believing that we were likely going to be launching our next location in Mountainside, NJ. The next morning I started to act as if this was going to happen. I started to call some church leaders across the country who have been involved in similar rebirth situations. At the top of my list was Kristy Rutter at The Chapel in Chicagoland. She is a practitioner of church mergers . . . a total expert on this stuff. I was looking for some help on the “due diligence” about the building it looked like we were going to inherit. She was more than willing to help and put me in touch with HB – their facility dude who has worked on 4 similar situations like this. It just happened that HB was in New Jersey the next day at the exact time that were walking through the space and he offered to come and take a look. (Don’t miss that . . . the guy who has done this facility transfer thing multiple times just happened to be in the neighborhood when we were looking through our new space.) Not a coincidence – a God instance! On May 20th Mountainside Chapel voted (29-0) to cease operation as an independent church and to transfer all their assets to Liquid Church . . . to support us as we launch our next campus as Liquid Mountainside! Again, I wish you could have been at that service at their church. They asked Tim to speak and he did an amazing job honoring the legacy of what God has done through this amazing church. It was incredibly humbling to see this collection of believers having faith that God’s best plans for the church were ahead of it and they were willing to risk to see it happen. No strings attached they are gifting us their facility to support the mission of taking church to the people! I don’t think I’m doing a good enough job capturing what has happened. In 33 days, God went from handing our church a book on church mergers to handing us a $4mil building in the middle of where we’ve been looking at our next campus. The heroes of this story are the leaders of Mountainside Gospel Chapel. I hope that I have the guts to act with such an open hand in the future when I’m called to hand the ministry off to the next generation. I’m wanting to learn from their humility in the midst of this transition. It’s breath taking. I can’t believe that I get a front row seat to see God at work in this way. I’m so privledged. Honor the Leadership Network Yoda – Warren Bird. We know stuff about churches! What an amazing story Rich. I’m sure that Liquid Church will make great use of your new facility. What a story. God is at work. Wow. We just had James MacDonald at our church this past weekend and he was preaching on miracles. Wow! That’s what he was talking about, awesome to see how God is at work. What an amazing story, Rich. I have tears in my eyes and am humbled by the divine orchestration in this story. Absolutely amazing. Praise to God for His wonderful ways! Praise to the congregation and leadership of Mountainside Gospel Church for their total humility and obedience in what God wanted the church to do! Thank you Tim for doing such a good job and showing tenderness and compassion toward the congregation as they turned their entire church history over to Liquid. 3 (more) Reasons I’m Proud of My Church! The intern opportunity I wished I had . . .
What Do You Want To Know About Multisite Church Launches? All About Multisite // Mergers & Rebirths Plus Free Downloadable Resources For You! All About Multisite // Help! Our Campuses Aren’t Growing!! All About Multisite // The 2019 Predictions Episode!